When cooking family meals, I am always searching for recipes that are not just healthy and low budget, but – crucially – my children will actually eat. This recipe for cottage pie (usually) covers all the bases. I can feel virtuous at persuading them to eat some red meat and extra vegetables. The costs are kept low by stretching the mince with added ingredients. 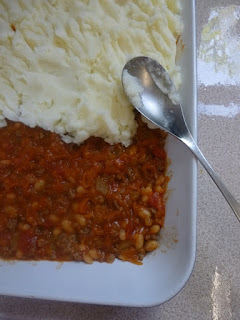 Plus the slightly sweeter taste in comparison to traditional cottage pie, from adding baked beans, carrot and tomato ketchup, is normally judged acceptable by the younger generation. Anyway, I recommend giving it a whirl. In our house, these quantities served three small children, two adults and a packed lunch. plus little bits of oil, milk and butter. Looking back at my receipts, the ingredients I used cost £3.50. Almost everything came from Morrisons, as my nearest big supermarket. 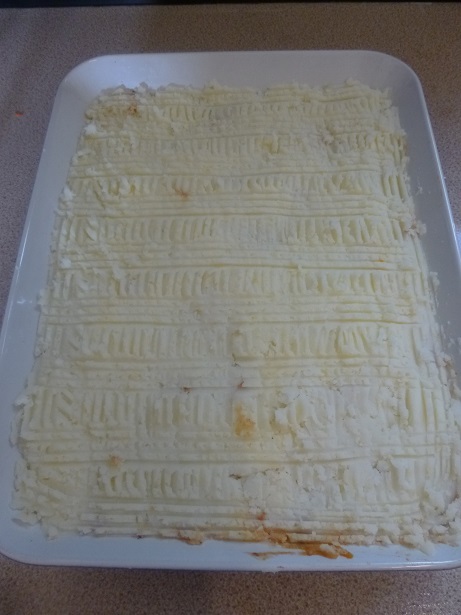 If I’d put in the whole 445g pack of lean mince, instead of carrots, celery and baked beans, the cottage pie would have cost £5.10 instead. 1. Peel the carrots, onion and potatoes. 2. Heat a tablespoon of oil in a frying pan, add the celery, carrot and onion, and cook gently until they soften. 3. 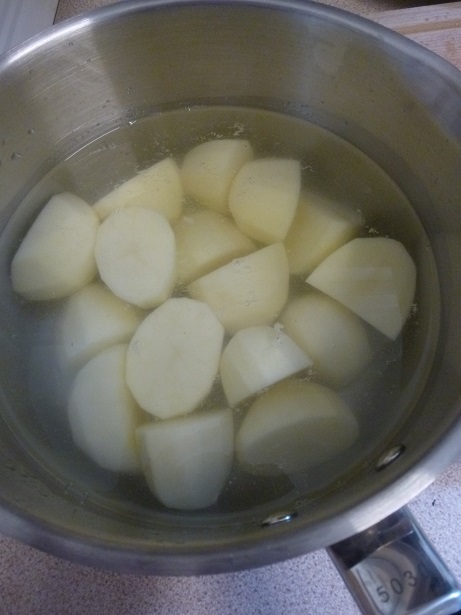 Meanwhile put the potatoes in a saucepan and cover with cold water. Put on the hob, bring up to the boil, then turn down the heat a bit and let them boil for about 16 minutes. Check if the potatoes are cooked by poking them with a knife – if they slip off easily, they’re done. 4. 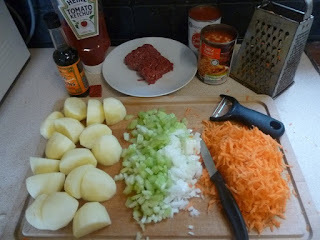 When the veg have softened, push them to one side of the frying pan and add the mince. 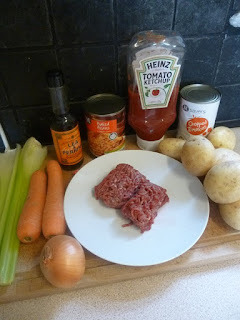 Poke it and stir it round with a fish slice so the mince breaks up in the pan while cooking. 5. As the mince turns from red to brown, stir it in with the veg. 6.Tip in the tin of chopped tomatoes and the tin of baked beans. I usually put a little bit of water in one tin, swill it around, tip it into the other can and swill it around, then tip into the pan. This gets the last of any beans and tomatoes into the mix. Then add a dollop of tomato ketchup, a slug of worcestershire sauce, and a crumbled stock cube, and let it bubble away until the mix is thicker and not watery. This could well take 10 or 15 minutes. 7. While the mince mixture is cooking, continue with the potatoes. Once they are sufficiently soft, drain the potatoes through a colander, pop them back in the saucepan and start mashing. Nowadays I use a potato masher, but I always used to use a fork and it was fine. 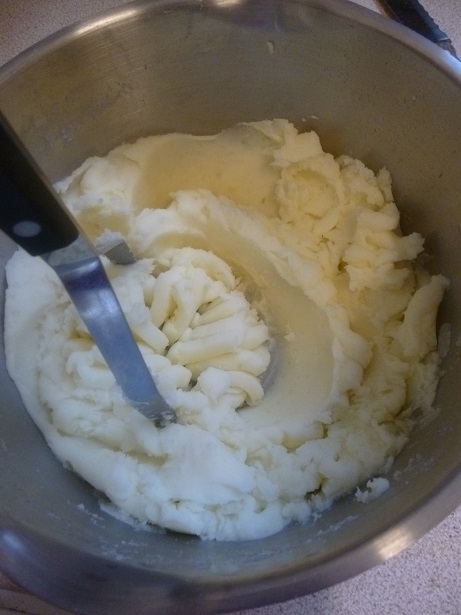 I add a bit of milk and a knob of butter to the potatoes to make the mash smoother and taste nicer. 8. Once the mince mixture has thickened, tip it into a big dish. To give you an idea, mine is a pottery dish about 25cm by 32cm. Splodge spoonfuls of mashed potato on the top, to cover the mince. 9. Use a knife to smooth out the top of the mashed potato. I also used a fork to draw lines on the top, to make it less obvious where the mash is different levels. Brush a bit of milk (only a tablespoon or so) over the top, to help the pie go brown in the oven. 10. 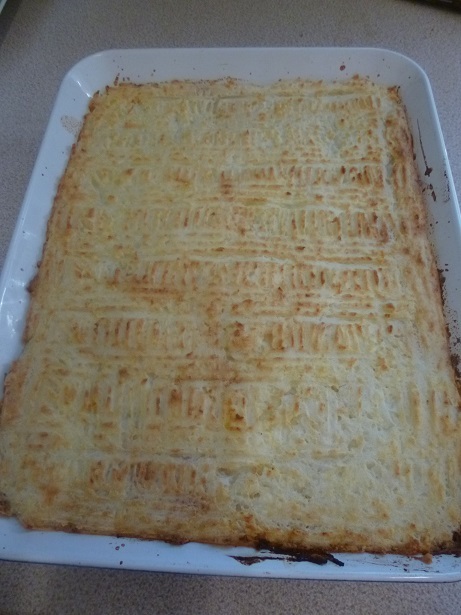 Put the cottage pie in a hot oven (about 200 degrees or Gas Mark 5) for 40 to 60 minutes, until the potato is browned and the mince mixture is bubbling hot. Let it cool down a bit before eating – I put portions for the children onto their plates, so they cool down quicker, before telling everyone to come and eat. 11. Ta dah cottage pie with smuggled veg, served on this occasion with peas and plentiful tomato ketchup. One child ate it with every appearance of enjoyment, and the other two needed a bit of encouragement, but we ended up with three clean plates*. In my house, that counts as a success. *For the record, one child was a visitor. I haven’t suddenly added another child to our family along with the move to Suffolk. Thanks for sharing how you stretched such a small amount of mince into a meal for 2 adults and 3 children. I am going to give this a try. Good luck, hope you like it!